Pets are considered part of the family in Australia, so it makes sense that we want to have them with us when we travel. Whether we’re using public transport, taking a holiday road trip, enjoying a train journey or hopping on a domestic or international flight. There’s a lot to think about when you travel with your pet, so here are some pointers to help you and your animal have a safe and pleasant journey – wherever you’re headed. What kinds of pets do we travel with? Travelling with pets isn’t difficult if you understand ‘best practices’ and adhere to all the rules and regulations regarding taking animals on various modes of transport. Perhaps the most important rule to remember is that pets are not permitted in Australia’s national parks. Not all pets enjoy travelling and you should always put the comfort and wellbeing of your animal first. Regulations and policies have a habit of changing, so contact the relevant authority to get the latest advice before travelling. Not all pets enjoy travelling and you should always put the comfort and wellbeing of your animal first. And in some circumstances, pets are better off left at home or at a boarding facility while you’re away. Sometimes, there are situations where taking your pet with you when you travel is impractical for one reason or another. In that case, you need to decide who will be looking after the animal in your absence. You may be lucky enough to have family or friends that doesn’t mind taking on a furry house guest. If you’re leaving your pet in a kennel or cattery, have a look at the facilities beforehand. A house-sitter or pet-sitter can usually work out cheaper than paying kennel fees. You also get the bonus of having someone look after your home while you’re away. You’ll know your dog is getting its daily walk, too! Another advantage is that your pets can stay in a familiar environment, which will be less stressful for them. Most house-sitters will look after your home for free in exchange for the accommodation they receive in return. Pet-minding services are available in many areas around Australia. Pets on Me can help with pet sitting, dog boarding and pooch day-care if you live in Melbourne, Sydney, Perth, Brisbane, Gold Coast, Sunshine Coast, Adelaide and some regional centres. Mad Paws is another well-respected pet-sitting service. If you’re looking for a pet hotel, Hanrob have been around for 35 years and have a variety of accommodation options for pamper-worthy cats and dogs. Every state has different rules regarding the circumstances in which your pets can travel on public transport. Always check online for the most up to date information. In NSW assistance animals with an Assistance Animal Permit can travel on all buses, ferries, trains, taxis and light rail. On NSW trains, only assistance animals and security or police dogs are permitted to travel. Other animals aren’t allowed on trains but may be okay on other transport services. For example, suitably confined small animals may be permitted on a bus with the driver’s permission. Assistance animals are allowed to travel on all public transport throughout Victoria. Pets such as dogs and cats are permitted as long as they’re travelling in a container meeting specific guidelines. Always check with your rail carrier to see if your pet is permitted on board. Some carriers only allow pets on if they are in a pet crate or on a lead and muzzled. When you’re out shopping for a new car your pet’s safety probably isn’t usually the first thing on your mind. But it’s a fact that some cars are a little more pet-friendly than others. A vehicle that’s roomy, square at the back, equipped with fold-down seats and a power-operated tailgate will make it much easier for pets to get in and out. Cargo barriers can also come in handy. The main thing to think about with pets in a vehicle is keeping them restrained. Loose pets are not only a distraction to the driver but is in danger of being harmed in an accident. A large dog becomes a deadly projectile when it’s flying toward the windscreen during sudden braking or a collision. Driving around with a dog on your lap is not only irresponsible – it’s also illegal everywhere in Australia. Check with your state’s traffic authority to familiarise yourself with the legalities applicable to driving with pets in the car. Driving around with a dog on your lap is not only irresponsible – it’s also illegal everywhere in Australia. The penalties are stiff if you’re caught driving with an unrestrained pet or if it’s deemed that your pet is interfering with your ability to safely drive the vehicle. You can lose demerit points off your license and be fined hundreds of dollars. The Prevention of Cruelty to Animals Act also says that any pet injured because they weren’t restrained can cost the owner a fine of several thousand dollars and the prospect of jail time. The same act penalises drivers who transport untethered dogs in the back of a ute. Does your comprehensive car insurance policy cover pet injuries in road accidents? If the answer is no, you might look into purchasing a pet insurance policy that will cover that possibility. Any pet shop can help you decide on the most appropriate car restraint for your animal. The two basic types are harnesses that attach to seat belts and box-shaped transport containers, otherwise known as pet crates. A crate must be properly secured and be big enough to let your pet sit erect and comfortably lie down. Don’t allow dogs to stick their heads out the window – they can get windblown debris in their eyes. It’s okay to crack the window for ventilation, but don’t have the opening large enough for their head to poke outside. Do your research before buying a seatbelt-attaching harness and make sure you get one that fits your pet properly. You should be able to pick up a sturdy harness for about $50. Harnesses are meant to be used in the back seat only. Harnessed dogs in a front car seat are at risk of injury if the airbag deploys in an accident. Harnesses are meant to be used in the back seat only. Harnessed dogs in a front car seat are at risk of injury if the airbag deploys in an accident. Cats travel best in a car when they’re secured in a robust cat carrier. These are normally made of moulded plastic, fibreglass, wicker and/or mesh coated with plastic. Buy a carrier suitable for the climate: ventilation is an important consideration. Cats are notoriously nervous car passengers, so expect an ‘accident’ or two to occur during the journey. Line the floor of the carrier with a towel to help with this, or – if the container is big enough – include a kitty litter tray. Birds can be driven around in their usual cage or in avian travel carriers if their cage is too big. They’re pretty low-maintenance passengers, provided they have enough ventilation. Make sure your bird carrier is firmly fastened to the car seat. Travelling with a pet in your vehicle is a bit more complicated than just securing them in their crate or harness and cruising down the road. Some thought and preparation needs to go into the process. If your pet gets carsick or is prone to the occasional toileting mishap, think carefully about what you might need. Waterproof seat covers and/or rubber floor mats for extra protection can be a good investment. Feed dogs 2-4 four hours prior to a road trip – not 10 minutes before they hop in. Make sure you’ve packed the basic necessities for pet care. Consider a pooper-scooper, plastic bags, medications, harnesses, grooming items, a big towel (in case your pooch gets wet) and your pet’s favourite toys. Bring whatever food they’ll be eating plus plenty of drinking water (taps aren’t always easy to find). Don’t forget their food and water bowl and a tin opener if required. 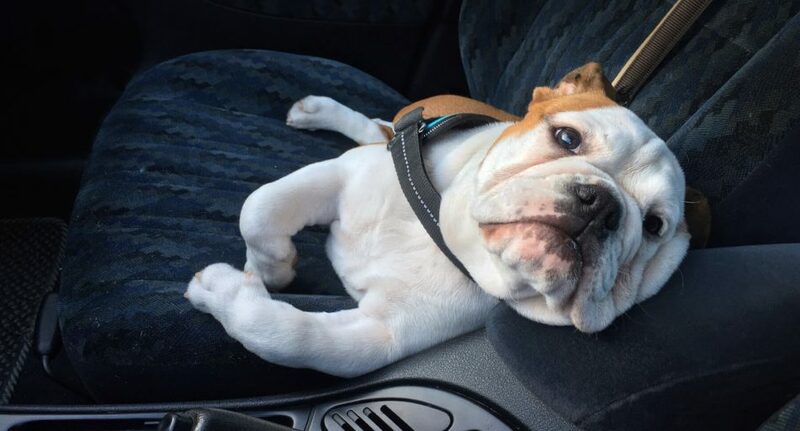 Just because you’re comfortable in the front seat doesn’t mean your pet is just as happy in the back. Check on them regularly to ensure they’re okay. Plenty of air flow, regular toilet breaks and occasionally stops for exercise are the way to go. Use the leash when you let dogs out in a new place to make sure they can’t run off. Be especially aware of the amount of ventilation in the car – both when on the move and when parked. The thick coats on cats and dogs make them more susceptible to overheating than humans. A vehicle in the sun can get hot at any time of year, even with the windows down. It’s illegal in Australia to leave the windows down in an unattended vehicle. It’s a bad idea to leave your pet in an enclosed vehicle when you’re not there. The RSPCA recommends leaving your dog secured in a safe, shady area outside the car. Make sure it has access to water and preferably being supervised by a reliable person. It’s a bad idea to leave your pet in an enclosed vehicle when you’re not there. When taking your dog on a road trip, make sure it can be identified in case it’s lost or stolen. Microchipping isn’t mandatory is all parts of Australia but it’s still worth doing, wherever you live. You can find out more about microchipping requirements here. Pets should be up date with vaccinations, flea treatments and worming before embarking on a major road trip. Get your pet used to any carrier or harness beforehand with a few smaller trips. Pack enough pet medications to last the distance. Some parts of the country are infested with paralysis ticks, so do your homework to ensure your pet isn’t exposed. Bring along a pet first aid kit to handle unexpected medical issues. There’s nothing worse than going on a road trip with your furry mate and encountering ‘No Pets Allowed’ signs everywhere. Fortunately, the owners of caravan parks, hotels, B & Bs, resorts and holiday houses are waking up to the fact that more and more Aussies are travelling with their pets, so there is a bit more choice around now than there used to be. Stayz and Holidaying with Dogs are two good resources to check out for information on pet-friendly accommodation around the country. They have loads of listings of places that will welcome both you and your pet. In some locations, you may even be allowed to have your animal in the same room with you. Putting your pet on an airplane isn’t always ideal (for you or for them) but sometimes it can’t be helped. To make it more interesting, every airline has its own policies. Make sure you’ve checked all the fine print on the airline’s website so you know you’re ticking all the boxes. Here are some basic guidelines for a handful of popular airlines, but remember that things can always change – so check with the carrier directly for updated information. Certain breeds of cats and dogs are more vulnerable to heat stress and respiratory distress than others. It’s wise to check with your vet about your pet’s suitability for air travel. These breed types include Persian and Himalayan cats, Pekingese, Pugs, Boston Terriers, Bulldogs and Japanese Spaniels. Certain breeds of cats and dogs are more vulnerable to heat stress and respiratory distress than others. Beware if you’re buying a dog abroad and hoping to bring it into Australia. Some breeds (such as pit bulls) are prohibited for import into Australia. Because space for pets is limited on aircraft, don’t leave it too late to make your booking. If the whole ‘pet on a plane’ idea seems all too hard, contact a company like Jet Pets: they’re pet travel experts who can handle all the nitty-gritty details for you (sort of like a travel agent for pets). Unless your veterinarian has specifically recommended it, sedation of pets for air travel is NOT recommended. Airlines are unlikely to take responsibility for any consequences associated with a sedated pet. If your pet travel carrier doesn’t meet an airline’s requirements the airline may refuse to transport your animal. A number of Aussie companies provide suitable pet transport containers, including Jet Pets, OzPets and Dogtrainers. If you don’t want to buy a crate, there are places where you can hire them. A week before you travel, ensure your pet is up date with worming, flea treatments and vaccinations. On the day before travel, give your pet plenty of exercise. It’s best not to feed your pet a large meal within eight hours of departure. On the day make sure your pet drinks plenty of water (planes are very dehydrating) and give it some exercise and a toilet break before travel. If your pet has a favourite blanket or toy, place that in the crate with them. You should have an ID collar for your animal as well; this can be attached to the outside of the crate. With the exception of assistance dogs, all pets on Virgin travel in the aircraft’s cargo hold. Dogs or cats must be at least 8 weeks old and less than 65 kilos in weight, including the crate. If your pet is over 12 years old, sick, injured, recovering from surgery, between 8 and 12 weeks old or has given birth within 48 hours of planned departure, you’ll require a ‘fit for travel’ certificate from your veterinarian. Virgin accommodates pet travel on most domestic flights where suitable pet handling arrangements are in place at each end of the journey. For international flights, Virgin only accepts pets from approved IPATA pet agents, due to the complexity of global quarantine laws. The pet crate must be supplied by you, in reasonable condition and sturdy enough to prevent the pet’s escape. The can’t be too small (precise measurements are supplied on the Virgin website). It should be lined with absorbent material and be made of polypropylene or metal, with no wheels attached. It can’t be collapsible and must have adequate ventilation. You can obtain further details from Virgin Australia. On Qantas, you can lodge your pet for travel at the same time you make your own booking; this applied to both domestic and international flights. Qantas Freight has an additional service for the transport of unaccompanied pets. Pet travel is no longer part of the free checked bag allowance at Qantas. Prices depend on departure point and destination, size of the crate and the weight of your pet. All pet containers must meet IATA specifications. KLM has a few options available for pet travel including pets as freight, pets as check-in baggage, kennels and even pets in the cabin. It’s okay to take a small dog or cat into Economy Class on most of their flights and also in Business Class on the majority of their European sectors. On most flights within the US, United allows most small animals to travel accompanied in the cabin. If your pet won’t fit under the seat, they’ll be required to travel in the cargo hold. Pets can only fly to Australia if you have a customs manifest. Australia’s strict quarantine laws benefit all of us. For example, our country is rabies-free, which is a wonderful thing. However, that strictness can also be costly for pet owners. One family that moved from Perth to Singapore paid $1700 to get their cat there and $4500 to bring it back. Another pet owner paid $15,500 to bring two cats and a dog back from the US. Never underestimate the stress, frustrations, delays and sheer expense of moving an Australian pet around the planet. Getting it back home again can become a bit of an ordeal. Animals lose their health status once it leaves Australia, which means bringing it back at short notice could be impossible. Pets can only return to Australia from ‘approved countries’. The best place to learn about all the details, dramas and red tape associated with bringing dogs or cats back home from abroad is from this Australian Government website. If you decide to go travelling with your pet, check what your pet insurance covers in relation to insurable events that happen away from home. In view of the rising cost of veterinary care, pet insurance can be a worthwhile investment. There are several Aussie companies that pet owners might find useful for moving their pets from place to place. Petcabs offers a pet transport service which has been operating since the 1980s. Dogmovers, based in South East Queensland, also specialises in pet transport for short and long distances and serves NSW, Victoria and Queensland. Petraveller can manage every aspect of your pet’s journey, before, during and after a flight to ensure your pet gets where it needs to go safely and in comfort. When you have to leave your pet at home, using a house-sitter can work out cheaper than paying kennel fees. Rules about travelling on public transport with your pet vary depending on where you live. Check with local authorities about what’s allowed. Pets in cars need to be properly restrained. Plan your pet-accompanied road trips carefully so your pet is safe and comfortable. Pet-friendly accommodation is becoming more common in Australia. But make sure to book well ahead of time for popular locations and busy times of the year. Australian airlines require accompanied pets to be transported in the cargo area. Every airline has very specific policies in regard to pet transport, so check their individual websites when planning your flight. Think carefully about taking your pet with you on flights – Australian quarantine regulations are strict and the whole process can be expensive.